In a medium skillet, heat oil to medium high heat. Season chicken breasts with salt and pepper. Cook on each side until golden brown but not cooked all the way through, about 3-4 minutes per side. Remove from pan and set aside. Add bacon to the pan; sauté for 3 to 5 minutes or until bacon fat has mostly rendered. Add onion and garlic; sauté for an additional 3 to 5 minutes or until bacon is crispy. Toss in asparagus, peas and mushrooms; sauté for 3 minutes. Add white wine and bring to a simmer, scraping any brown bits from the bottom of the pan with a wooden spoon. Add chicken stock and heavy cream; return to a simmer. 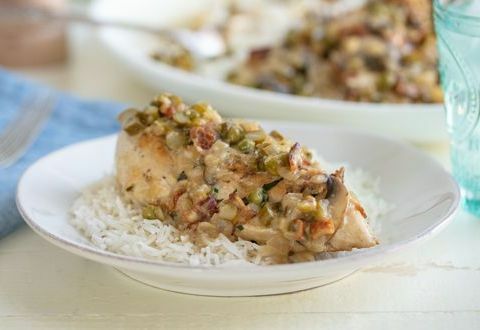 Return chicken breasts to the skillet and simmer for 15 minutes. Season to taste with salt and pepper. Top with fresh chopped tarragon to serve.